a trailer designed for armament purposes by the New Zealand Defence Force. a trailer pump for fire fighting purposes. b) has chain links with a material cross-section less than 7.1mm, or there is no evidence that each chain has a breaking strength of at least twice the laden weight of the trailer (Note 3). d) is cracked or distorted. e) has a nut or locking pin that is missing or significantly corroded. iv. the weld is significantly corroded, has deteriorated or is cracked. e) appears to be too weak to withstand a load of about twice the likely maximum laden weight (as far as can be reasonably estimated by the inspector) (Note 3). 6. The trailer is an unrepaired Trailpro 8x4 Tradesman (model number TP5) or a Trailpro 8x5 Tandem (model number TP8), with a bolt-through drawbar attachment (these trailers are subject to safety recall) (Note 4). 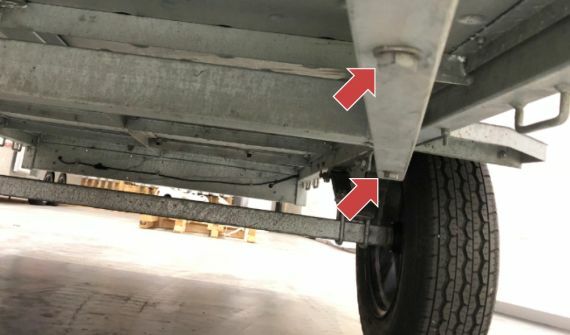 See Figure 8-1-2 for advice on identifying these trailers. Laden weight means the weight of the trailer and its load, if any, for the time being carried. A vehicle inspector may be presented with a trailer (usually unladen, such as a boat, car or horse trailer) that has a laden weight below 2000kg, but that is likely to have a laden weight exceeding 2000kg when it carries its normal load. In such a case, the vehicle inspector should make the vehicle operator aware, for example by putting a note on the checksheet, that the trailer may not comply with safety chain or shackle requirements when the trailer carries its normal load. A safety chain or shackle may be marked as complying with a standard and with a chain designation size that equals the maximum laden weight of the trailer, for example, with 25 or 2500 which denotes 2500kg. This means the chain and shackle are suitable for a trailer with a laden weight of up to 2500kg as the standard has already taken into account the required breaking strength. The NZ Transport Agency is aware of a safety risk with the Trailpro brand of light trailers which were sold through Bunnings NZ between 1 January 2006 and 12 October 2018. The TP5 has a single axle and a tray size of 8'x4' (2.4m x 1.2m). The TP8 is a tandem axle model with a tray size of 8'x5' (2.4m x 1.5m). Other models, such as the TP1 and TP6 are not included in the recall and have a smaller tray size. More information can be found in the safety recall notice on the Transport Agency website. Bunnings is currently working on a repair process and we will update this once that is in place. 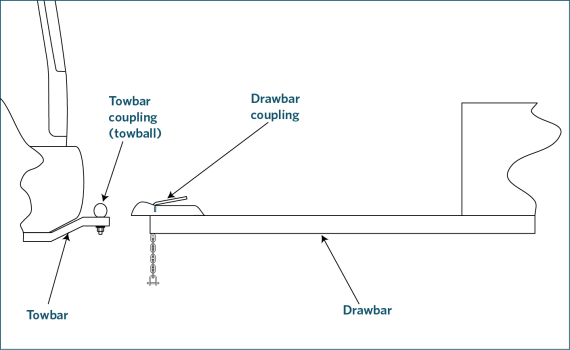 Affected trailers are fitted with an identification plate which is located on the outside of the trailer drawbar near the tow coupling. The identification tag may be missing, faded, damaged or obscured. All Trailpro models have drawbars that are bolted rather than welded to the trailer. The TP5 has a single axle and a tray size of 8'x4' (2.4m x 1.2m). The TP8 is a tandem axle model with a tray size of 8'x5' (2.4m x 1.5m). Other models, such as the TP1 and TP6 are not included in the recall. 1. A trailer must be fitted with a tow coupling that is fit for purpose and in sound condition. a) a trailer designed for armament purposes by the New Zealand Defence Force. b) a trailer pump for fire fighting purposes. b) have a coupling system that has a manufacturer's load rating commensurate with the laden weight of the trailer. 4. A trailer must be be fitted with a tow coupling that is fit for purpose and in sound condition. 5. A safety chain or cable must be of sufficient strength to hold the trailer secure under all conditions of road use. Page amended 23 November 2018 (see amendment details).